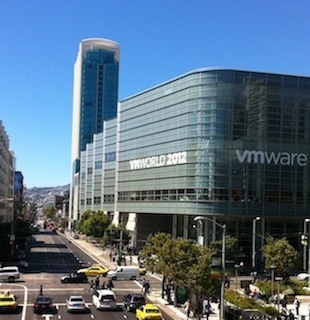 VMworld2013 is going on in San Francisco this week. 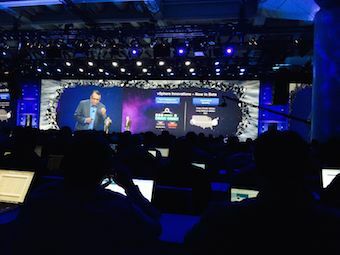 The big news is the roll out of network virtualization in NSX and vCloud Hybrid Service (vCHS) but there were a few tidbits in the storage arena worth discussing. Virtual SAN public beta – VSAN was released as a public beta and customers can now download a copy of VSAN from www.vsanbeta.com. VSAN will construct a pool of storage out of local attached disks and flash across two or more hosts. It uses the flash as a read-write cache for the local disks. With VSAN customers can elect to have multiple tiers of storage be supported within a single VSAN pool, as well as support different availability (replication) levels, and some other, select characteristics. VSAN can easily scale in performance and capacity by just adding more hosts that have local storage. Now all that stranded local storage and flash server level resources can be used as a VM storage pool. 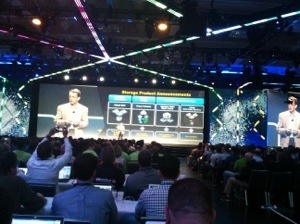 VMware stated that they see VSAN as usefull for tier 2/tier 3 application storage and/or backup-archive storage uses. However they showed one chart with a View Planner application simulation using a 3-host VSAN (presumably with lots of SSD and disk storage) compared against an all-flash array (vendor unknown). In this benchmark the VSAN exactly matched the all-flash external storage in performance (VMs supported). [late update] Lot’s of debate on what VSAN means to enterprise storage but it appears to be a limited in scope and mainly focused on SMB applications. Chad Sakac did a (real) lengthy post on EMC’s perspective on VSAN and Software Defined Storage if you want to know more check it out. Virsto – VMware announced GA of Virsto which uses any external storage and creates a new global storage pool out of them. Apparently, it maps a log structured file system across the external SAN storage. By doing this it sequentializes all the random write IO coming off of ESX hosts. It supports thin provisioning, snapshot and read-write clones. One could see this as almost a write cache for VM IO activity but read IOs are also by definition spread across (extremely wide striped) across the storage pool which should improve read performance as well. You configure external storage as normal and present those LUNs to Virsto which then converts that storage pool into “vDisks” which can then be configured as VM storage. Probably more to see here but it’s available today. Before acquisition one had to install Virsto into each physical host that was going to define VMs using Virsto vDisks. It’s unclear how much Virsto has been integrated into the hypervisor but over time one would assume like VSAN this would be buried underneath the hypervisor and be available to any vSphere host. vSphere Flash Read Cache – customers with PCIe flash cards and vCenter Ops Manager, can now use them to support a read cache for data access. vSphere Flash Read Cache is apparently vmotion aware such that as you move VMs from one ESX host to another the read cache buffer will move with it. Flash Read Cache is transparent to the VMs and can be assigned on a VMDK basis. vSphere 5.5 low-latency support – unclear what VMware actually did but they now claim vSphere 5.5 now supports low latency applications, like FinServ apps. They claim to have reduced the “jitter” or variability in IO latency that was present in previous versions of vSphere. Presumably they shortened the IO and networking paths through the hypervisor which should help. I suppose if you have a VMDK which ends up on an SSD storage someplace one can have a more predictable response time. But the critical question is how much overhead does the hypervisor IO path add to the base O/S. When all-flash arrays now sporting latencies under 100 µsecs, adding another 10 or 100 µsecs can make a big difference. In VMware’s quest to virtualize any and all mission critical apps, low-latency apps are one of the last bastions of physical server apps left to conquer. Consider this a step to accommodate them. vVols – VMware keeps talking about vVols as an attempt to extend their VSAN “policy driven control plane” functionality out to networked storage but there’s still no GA yet. The (VASA 2 or vVol) spec’s seem to be out for awhile now, and I have heard from at least two “major” vendors that they have support in place today but VMware still isn’t announcing formal availability yet. Unclear what the hold up is, but maybe the spec’s are more in a state of flux than what’s depicted externally. Most of this week was spent talking about NSX, VMware’ network virtualization and vCloud Hybrid Services. When they flashed the list of NSX partners on the screen Cisco was absent. Not sure what this means but perhaps there’s some concern that NSX will take revenue away from Cisco. As for vCHS apparently this is a VMware run public cloud with two now expanding to three data centers in US, that customers can use to support their own hybrid cloud services. VMware announced that SAVVIS is now offering vCHS services as well as VMware with data centers in NY and Chicago. There was some talk about vCHS offering object storage services like Amazon’s S3 but there was nothing specific about when. [Late update] Pat did mention that a future offering will provide DR-as-a-Service using vCHS as a target for SRM. That seems to be matching what Microsoft seems to be planning for Azzure and Hyper-V DR.
That’s about it as far as I can tell. Didn’t hear any other news on storage changes in vSphere 5.5. But this is the year of network virtualization. Can’t wait to see what they roll out next year.